I tried using this mask as a gift. I am willing to repurchase this product after I am done with it. This was preventing the aging but I don't know if it is really working I think I have to wait. I bought the Clinique eye mask by trusting the judgment of magazine beauty editor. The result was not satisfying. 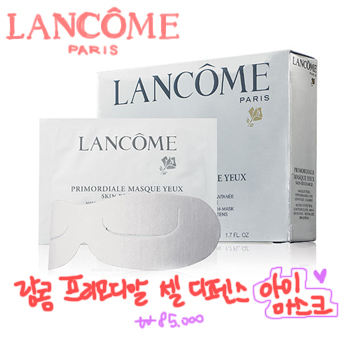 Lancome cell defense eye mask didn’t have any smell and I waited for 5 minutes. It was so moisturizing that I can apply all over my face through my neck. After 5 minutes when I looked at the mirror, I was surprised that my eyes calm down from little bit of swollen. I felt fresh and mostly I didn’t felt tired. There wasn’t an effect on the dark circle but it helped on blood circulation. It is really different from using the eye cream. It is good to use for one or two times a week but I like to use it when my eyes feel tired. Also the shape of the mask is great. It sticks on really well and covers wide range of the eyes. I recommend this who wants to prevent from getting any further wrinkles. I recommend using this before going to sleep. thanks for the beauty tip!!! I want to try this mask!! Thanks for your comment also! I like your blog! I want to try it too. I haven't tried any eye mask! Nice blog! I met u on Bloggers. Keep it up!